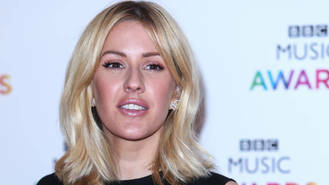 The British pop star was in Europe earlier this month (Jan16) when the all-terrain vehicle she was being transported in suffered a huge technical problem in the midst of extreme weather conditions. Photographer Conor McDonnell, who has been documenting the singer's shows on the road, first shared the scary tale on Instagram.com on Monday (25Jan16), when he posted a snap of their submerged vehicle in the middle of a frozen lake - and revealed they would have died if they hadn't climbed out of the sunroof. "This photo is from when we were in Norway a few weeks ago," Conor explained. "That moment when you're in -25 (degrees) in the middle of nowhere in Norway in the pitch black and your belt wagon crashes through the ice in the middle of a lake and you have to emergency evacuate through the roof. "'Oh s**t we're in' was my first though (thought). Second was to take photos. We were in the front cabin. That is pretty much under water in this photo. A few minutes later it was all completely gone under the water and ice for good." Ellie later shared the same image on her Instagram page, and captioned it, "Throwback to a few weeks ago when myself and @conormcdphoto nearly ended up in a lake in -30... Note to self don't drive a BV206 over a frozen lake". The singer hasn't let the incident put her off travelling - she is back on the road after kicking off her Delirium World Tour in Hamburg, Germany last week (21Jan16).